Rich, from the Atlanta based music blog Cable & Tweed, turned me onto this live R.E.M. tribute compilation last week entitled Finest Worksongs. The comp consists of the material from the concert of the same name held in Athens, GA at the 40 Watt club last Fall. Artists include: Drive-by Trucker Patterson Hood, Liz Durrett, Five Eight, Modern Skirts, The Observatory, Bain Mattox, Claire Campbell, Tin Cup Prophette. It’s also worth noting that performances are apparently propped up by Stipe, Buck, Mills, and R.E.M. pal (and Minus Fiver) Scott McCaughey. The disc is hit or miss; as a big fan of the Drive-by Truckers I was admittedly a bit disappointed by the Patterson covers — a bit too rough for me. The absolute highlight of the comp is this cover of “The One I Love,” by Liz Durrett, ironically the only track not recorded at the 40 Watt show (due to illness). Elsewhere: As mentioned last week, R.E.M. fans should check out Pop Songs 07, a new blog focused solely on the discussion of R.E.M. songs – one by one. 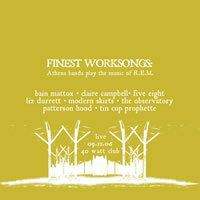 Purchase: Finest Worksongs: Athens Bands Play The Music of R.E.M. Note that Liz’s track was recorded by Sloan Simpson — local taper extraordinaire and writer of Southern Shelter live Athens mp3 blog (although Liz’s track was taped at The EARL in Atlanta).